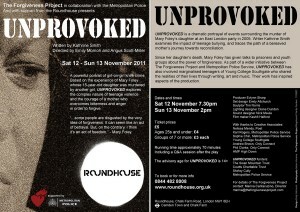 Set designs for the play ‘UNPROVOKED’ at the Roundhouse, November 2011. Witten by Kathrine Smith and produced by Evlynn Sharp, UNPROVOKED is a dramatic portrayal of real events surrounding the murder of a teenage girl in London. Supported by the Forgiveness Project and Metropolitan Police Service, the play examines the impact of teenage bullying, and traces the path of a bereaved mother’s journey towards reconciliation. 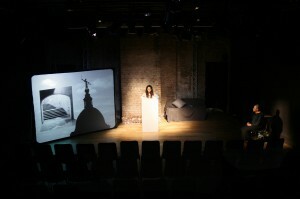 Allchurch created a simple stage design, with the use of rear projection to reflect the changing mood and locate the characters throughout the play. 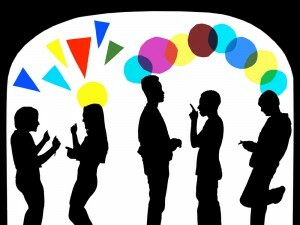 She was involved with workshops with marginalised teenagers from Young College Southgate who shared the realities of their lives through writing, art and music. Their work inspired aspects of the production.